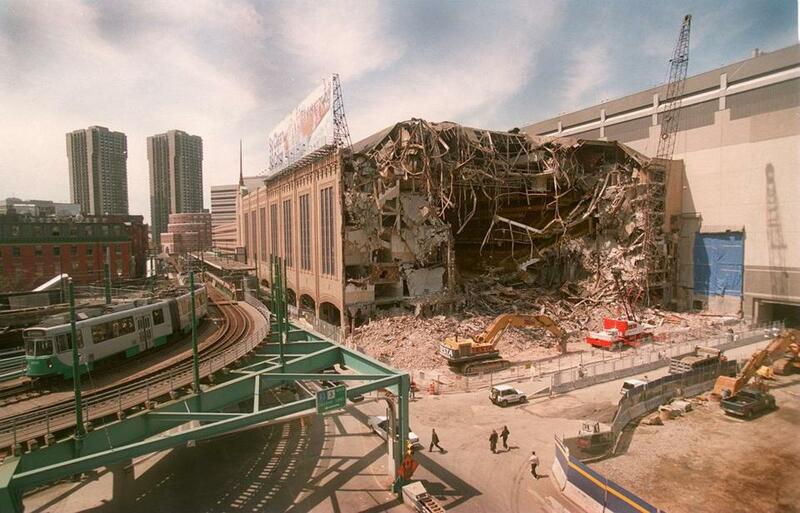 The demolition of the Boston Garden in 1998 and the elevated Green Line tracks. The owners of the TD Garden are resurrecting plans for a high-rise development in front of the arena that will include a pair of 400-foot towers containing offices, hundreds of residences, a hotel, and stores. The project, which would create a modern, retail-filled gateway to the North Station area, has gained new momentum in recent months, with Target Corp. and Stop & Shop negotiating plans to open stores in the complex, according to several people who have been briefed on the plans but were not authorized to speak publicly. Even by Boston terms, the development has taken a long time to come together, languishing through years of drawn-out Big Dig construction, the removal of the elevated Green Line tracks, and an economic downturn that stifled major real estate projects across the country. The project was initially approved by the state in 1989. The Garden’s owner, Delaware North Cos., recently teamed up with Boston Properties Inc. to craft a new plan that includes more than 1.3 million square feet of new space. The towers would rise on the old site of the Boston Garden, which has been used for parking since its successor arena opened in 1995. The project still needs approval from the Boston Redevelopment Authority, but the developers hope to begin construction later this year. Executives with Stop & Shop and Target declined to comment, as did Boston Properties and Delaware North. A brochure being circulated about the project shows Target occupying multiple levels at the base of the complex, along with a supermarket that would have a prominent entrance on Causeway Street. The supermarket is not named in the brochure, but Stop & Shop has been looking at different locations in the neighborhood for several years. The project is one of several large redevelopments that would transform huge swaths of property in the city’s West End in coming years. Collectively, developers are proposing to build more than 1,800 residences, office towers, public parks, stores, and restaurants. Five large, mixed-use projects are planned for lots immediately surrounding the TD Garden. The area’s revival has unfolded in fits and starts over the years. It started with the Big Dig and redesign of North Station, and then attracted its first significant private investment with construction of the Avenir apartment complex at the corner of Canal and Causeway streets. After development stalled during the economic downturn, the area got a huge boost recently when Converse Inc. agreed to move its corporate headquarters to the Lovejoy Wharf development off North Washington Street. The project by the Beal Cos. and Related Cos. will bring hundreds of new workers to the property and result in construction of a residential building, stores, a large waterfront park, and a new section along the city’s Harborwalk. Nearby, developers AvalonBay Communities Inc. and Equity Residential are each planning 500-unit apartment buildings, and Simpson Housing is building a 286-unit apartment and retail building overlooking the Zakim Bridge. The project on the old Garden site promises to dramatically affect the neighborhood. In addition to a new gateway to the North Station area, it will also bring a supermarket and other retail amenities that people there have sought for several years. Residents and public officials have been pushing developer Trinity Financial to open a supermarket in its One Canal residential and retail development along the Rose Fitzgerald Kennedy Greenway. But the site of the old Garden is more centrally located and offers more retail space. The brochure by Boston Properties and Delaware North shows a 45,000-square-foot supermarket that would be situated on an underground level. Above the supermarket would be a 430-foot tower with hundreds of residences, a hotel with up to 300 rooms, and a multilevel Target. A second tower would rise up to 440 feet and contain 600,000 square feet of offices above a retail base with a mix of shops and restaurants. The buildings would be designed with generous amounts of glass and include a large archway leading visitors into the Garden. The complex would be situated over an entrance to North Station, providing easy transit access for residents, workers, and hotel guests. In all, the project will have 300,000 square feet of retail space.